Via the Genoa-Ventimiglia motorway, exit at Finale. From the toll booth, continue to the main road and continue downhill on the left towards Final Borgo. Arrived at a roundabout ground level you turn left through the bridge in front of the historic door of the hamlet. Continue to the left, on a paved road towards Calice Ligure. Continue with the torrent to the left and the houses to the right, for a few hundred meters, long and in moderation, until you meet the sharp turn right uphill towards the Rocca. Go back up this deviation, passing several bends, up to the point where a ban restricts access to the valley. There is space to park. The continuous asphalted and winding road for a few km to the point where it ends, in the small plateau between the north wall of the fortress of Perti and the south of Montesordo. This stretch can be walked downhill in about fifteen minutes. It is customary for climbers to continue in the car arriving at the open space in 5 minutes. Given the discretion of climbers, the inhabitants of the valley are tolerant, if they are made of respectful parking and does not get dirty everywhere! However, access to non-residents vehicles remains officially prohibited. From the dirt track at the base of the north wall, take the path that goes behind the fountain and the picnic tables to the left. The track is marked with three red FIE fitting dots. In a few minutes you cross a first junction and continue to SX, (omitting the track that would lead to the historic corner on the right). Shortly after you reach a second fork, you leave the main path to the left and continue instead to the right, on a false floor, up to a sort of small clearing. At this point they attack most of the northern routes. In front you can see Via col Vento and immediately on the left the trail that leads uphill, above a rock, to the attack of Nonno Dino. Still on the left, you can see red siding marks on a track that runs along a rocky step. From it we descend to a new track and, after a few tens of meters, we can see DX, in the first corner near a rock, an open cave from which the Panta Rei road starts. (On the outer edge of the antrum the red-painted name is visible). Leaving aside this attack you continue to SX on the path, you pass a difficult step downhill on a log and continue until you reach a fork. You leave the main path that goes straight ahead and you take a very steep track that goes up to the right (faded orange arrows). Continue until you reach a new fork: continue to the left and leave the trail that goes up steeply to the left. The path with a few turns then arrives at a dirt track. The Consolando Consuelo road starts on the left. Continue to the right uphill, you pass the attack of Anna Pagnini, and climbing again you get to a cave from which Aprosdoketon starts. Approximate approach in about 10 minutes. To repeat the Aprosdoketon route, 10 quickdraws and connecting tapes with goustands are required to equip the French stops. Gear: Currently the road is protected with close-spun stainless steel taps. In the central part the contribution of the climber Renato Berruti, already the author of climbing routes on the same wall, was very important. 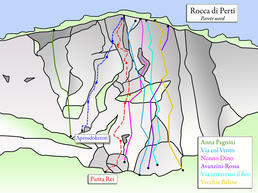 Despite being a modern climbing route, it should be noted that the climb has objective mountaineering characteristics. Mountaineering and climbing are potentially dangerous activities that everyone carries out at their own risk. The way is not to be underestimated and must be repeated only by experienced people, who are able to analyze the conditions and the related equipment at the time of repetition. Gr. Note: La via parte sul bordo sinistro della grotta e traversa a DX con movimenti tecnici, belli e faticosi. (Chi lo desidera può azzerare il passaggio cruciale). Dopo un trasferimento si attacca una bella placchetta e si continua in obliquo verso DX su una seconda, difficile e tecnica. Gli ultimi dieci metri sono decisamente più semplici e conducono piacevolmente alla sosta un po’ appesa. (Sosta su 2 resinati da 10 mm + 1 fix di collegamento con piastrina e grillo). É possibile partire direttamente sul diedro diretto a DX, III-IV con un movimento proteggibile con un friend medio-piccolo. È anche possibile partire direttamente da dentro la grotta, come fosse un tetto ammanigliato di 5-6 metri di 6a ad 80° di strapiombo. Entrambe le soluzioni sono state liberate e graduate e sono divertenti. Attualmente il primo tiro di uscita dal bosco è piuttosto sporco di terra, e risulterà pulito soltanto dopo le prime piogge copiose di fine anno. Gr. Note: Si continua quindi a DX, salendo su placca o sfruttando il diedro evidente, con roccia lavorata dall’acqua, guadagnando un pulpito. Si aggira verso DX un piccolo masso e si rimonta su uno scalino che porta subito al primo fittone che protegge l’evidente fessura sotto “L’Arco Rosso”. Da questo punto parte la sequenza più bella ed estetica di tutta la via: s’insegue infatti una fessura prima verticale, poi orizzontale verso DX, con una serie d’incroci in Dülfer, fisici ed estetici, che richiedono un eccellente uso dei piedi. Si arriva quindi alla sosta su un nuovo pulpito a DX. (Sosta doppia con 4 fittoni resinati da 10 mm collegati). Gr. Note: Dalla sosta ci si sposta di poco a DX e si attacca un risalto, il passo chiave del tiro, e si continua su una serie di balze divertenti e con buone prese che in breve conducono al canale in cui è posta la quarta sosta, presso un’accennata nicchia. (Sosta su 2 resinati da 10 mm). Gr. Note: Si procede quindi superando direttamente il brodo superiore della nicchia e si continua con un’arrampicata morfologia ed entusiasmante, molto montagnarda, sino all’ultimo ristabilimento sotto la sosta. In questo punto la linea è molto vicina a Panta Rei, che però esce sul pilastro a DX. Aprosdoketon invece forza la fessura di SX con un ultimo movimento faticoso che guadagna la sosta sul bel terrazzino a DX. Dalla termine della via con un passo semplice si valica la cornice rocciosa e ci si trova sul sentiero. (sosta su 2 resinati da 10 mm). N.B. è possibile unire gli ultimi due tiri effettuando un’entusiasmante lunghezza unica di 40 m. Sono necessari 14 rinvii, più uno per usare uno dei chiodi di sosta come un tradizionale resinato. Si consiglia in tal caso di allungare le protezioni con dei cordini per evitare attriti nella corda.